In this month’s Multiversity Roundtable, Deadshirters Max Robinson, Jason Urbanciz, David Uzumeri, and Joe Stando fine-tuned their vibrational frequencies and shared their impressions of the final installment. The hotly anticipated conclusion of Multiversity is a good comic but, unfortunately, it’s not a great one. While Watchmen visual critique Pax Americana, (plainly the best single issue of 2014) is a high watermark to live up to, The Multiversity #2 is tasked with tidying up a smorgasbord of loose ends. While there’s plenty to enjoy in this issue (Morrison’s cartoonishly malleable Captain Carrot is a treasure), we’re left with a final issue that doesn’t give any kind of meaningful closure to the preceding multiversal saga laid down over the better part of a year. A remorseful, redeemed Superjudge feels shame over letting loose Darkseid, a character who never actually appears; the intriguing mystery of the robotic Lil Justice League is answered with little fanfare. Even our heroes’ final confrontation with the puppet master of The Gentry is literally handwaved away. I wanted more than this, frankly. Reis’ art in Multiversity #2 is as consistent as ever, George Perez-like in its workmanship here. The real highpoint of this issue, a meta-textual callback to the GMo and Howard Porter’s first JLA arc with EVERY incarnation or riff on The Flash appearing to save the day with a super-powered punch, is the kind of comic book high concept Morrison excels at and the kind of thing we’re here for. Time will tell if Multiversity #2 will read better collected or if it’s simply another instance of Morrison’s ideas outrunning his pen. I’ll say this: I’ll take an ambitious failure over one of the Big Two’s safer conclusions. The Multiversity ends pretty much in the same way it began: as a big, bombastic team-up story between a bunch of disparate characters, with plenty of Easter eggs and meta references thrown in. Initially I almost felt disappointed. There’s no final twist? No big reveal that turns everything on its head? But after rereading, it’s a pretty great encapsulation of the kinds of stories Morrison has used superhero comics to tell. 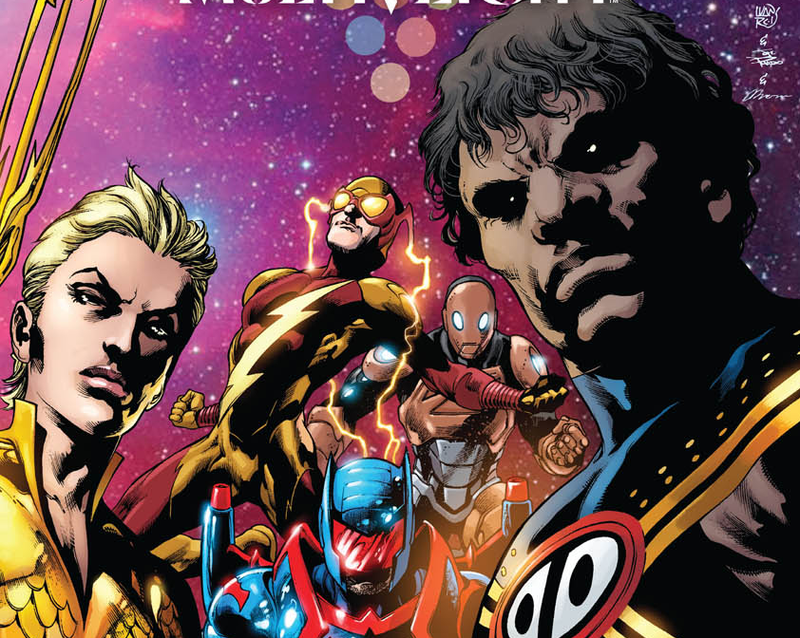 Multiversity #2 is an issue about hope, about redemption. It lets our heroes beat back the Gentry, a set of villains so awful that we’ve only been given fleeting glimpses of them thus far. It restores Nix Uotan, and even closes the frame story in a cute, satisfying manner. Like the first issue, there’s a lot of solid grace notes, like the cartoon physics gags, or the use of speed-reading the series or giving it to Harbinger to gain the upper hand. With Convergence going on, it makes two big DC books out this week about crossover events that have little to no effect on the main universe, which is odd. I like to think of it as a gentle critique of continuity, that even if you’re not into whatever is going on right now in comics, there are always other stories being told somewhere else, and there’s something for everyone. In the end, Multiversity #2 is pretty solidly the Grant Morrison archetype: a story where everyone puts aside any differences or fights and becomes a force of life and creation in order to beat back a force of death and destruction. If it wraps things up a little too neatly, I don’t mind. In a series where most of the issues have ended with major cliffhangers or dire straits, it’s nice to see the good guys still win in the end. Grant Morrison’s journey across the multiverse of DC Comics comes to an end with a massive bang, but one that doesn’t quite land as hard as it could have. The Gentry have begun their final assault on the 52 worlds of the multiverse, with the greatest heroes of every world marshaling their forces to defend themselves. Meanwhile, the multi-world force gathered in Harbinger’s House of Heroes in the first issue must find a way to use the Multiversity Guide Book to find out where their main foe is, and how to defeat him. It’s great seeing all these twists on familiar characters team up to fight against overwhelming odds, especially when Red Racer gathers the entire multiverse of Flashes to land one incredible speed-of-light punch on Nix Uotan, the enslaved Super Judge. But the problem is that we never find out who the villain is or the details of his plan. The Empty Hand who is referenced throughout the series stands revealed, but while he bears the same marking as Ultra Comics, and we are told he originated from Earth 33, Ultra’s home world, I have no idea if it’s supposed to be him. Or us? Earth 33 (or Earth Prime) is supposed to be “our Earth,” so maybe it’s a meta-textual comment on how we readers (and writers) are constantly putting our creations through hell for our own amusement? Regardless, they never actually fight him, with the Empty Hand declaring he was just testing them, and then banishing them from the Earth he has destroyed. The best part of this issue is Morrison creating Operation Justice Incarnate, a team of heroes from all the Earths meant to combat incursions that threaten all of existence. That DC will most likely not do anything with such a great team makes me feel even worse that this issue isn’t a period on Morrison’s time at DC, so much as an ellipses. This is most likely Morrison’s final word on DC Comics after a long series of Final Words On DC Comics, so it’s hard not to wonder if he went one too far. While he still has Wonder Woman: Earth One coming in the Fall, I doubt that will have the metatextual riffs that his Final Crisis, Batman, and this series have had. While this final issue isn’t ideal, the worst part about it is that it’s the final issue. Throughout this massive crossover he’s created new concepts or reintroduced ones that have long fallen out of favor with DC proper, and it’s a shame to know that they’re all going to be put back into their box. I’m going to miss The Multiversity a lot, but I’m already looking forward to rereading the whole series in one go, certain I’ll find more and more things that will shape how I feel about it. The finale of Multiversity seems to have gone over as rather underwhelming, and I’ve got to add my opinion to that stack. It almost delights in its dearth of grand revelations or payoff; while the “to be continued” that concluded Final Crisis: Superman Beyond felt like an ominous threat to the concept of finality, here the sentiment just seems more like a surrender to the business realities of corporate superhero comics—a book which, in a completely valid (if perhaps uncharitable) reading, could be said to have “superheroes pay the rent” as the central theme. 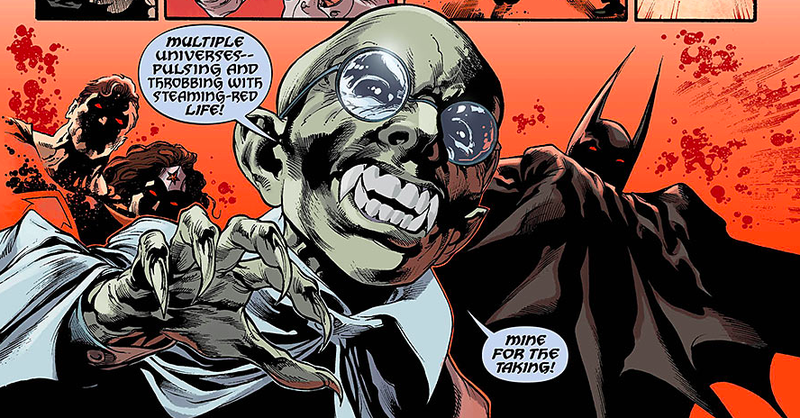 Morrison described this issue to USA Today as “me doing me to the point of almost parody,” and by the time the panel borders combine with the parallax lines on a panel with a gigantic Rubik’s Cube and a Flash analogue comments on this being like his favorite Justice League comic, it’s easy to see what he means. Reis does the best job you could probably do with this issue’s mandate, telling a traditionally trippy Morrison story in a traditionally DC Comics superhero style. More than anyone else at the company, Reis has established himself as the closest to the purest form of that superhero comics style. Both of these narrative masters are served in what’s likely the work of Reis’s career, even dealing with three inkers and colorists each—Wandjina looks like an Aboriginal dude and not a white guy colored brown, and also looks completely natural standing next to a vampire god and a decapitated superhero rabbit. Still, for all that Morrison tries to hang a lampshade on it, it’s hard to resist the feeling that we’ve read all of this before, and after some of the truly forward-thinking and impressive single issues in the middle of Multiversity, I expected something a bit more groundbreaking for the finale. Still, rereads may reveal more layers and open it up, and if not…well, there’s always Secret Wars. Scott Snyder and Greg Capullo’s “Batman Endgame” arc comes to a furious conclusion in this issue, and it lands with kind of a thud. 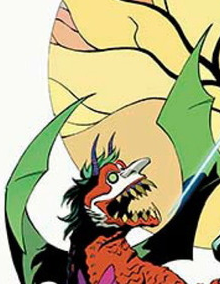 Billed as the “Last Joker Story,” it sets up the villain as possibly being an immortal force that has haunted the city of Gotham its entire existence. Joker has prolonged his life using the fluid “Dionesium,” plus he’s now weaponized it to turn the citizens of the city into a laughing zombie army. Batman musters his allies and foes into a last ditch assault on the Joker in order to get some of his spinal fluid, which will allow him to manufacture a cure. This leads to a final confrontation between the two in a cave beneath Gotham, seemingly putting a period on this run of Batman since the New 52 began, with (highlight for spoiler text:) both seemingly dying at the end. As I said back in my review of the first issue of this arc, I’m just tired of the Joker, and unless you’ve got a great new spin on the character, it’s best to just let him alone. Sadly, Snyder doesn’t have a new take here, more of a greatest hits of other takes, and it made me wonder why I’m not just reading those. We have a seemingly all-powerful Joker controlling superheroes (Emperor Joker), a final confrontation in a cave (The Dark Knight Returns) that results in (spoilers again:) the death of Batman (Batman R.I.P. and The Dark Knight Rises). We even get a brief meditation on the nature of Batman himself at the end, and compared to the aforementioned Rises and Gaiman’s Whatever Happened To The Caped Crusader? (a book I feel is way underrated), this just feels clumsy. Greg Capullo’s art is very good here, but it doesn’t feel like he’s given a lot to work with. His best bit is the final confrontation in the cave toward the end. He’s going for a Frank Miller vibe and totally nails it, to the point where I’m wondering if he’s trying out for the DK3 job. The problem with this is that it again invites comparisons between this book and Dark Knight Returns #3, in which Joker and Batman have their final face-off in the tunnel of love. This is a good comic, but that is a classic. FCO Plascencia’s colors are, as ever, a highlight on this comic. I love the bright neon background colors that Plascencia and Capullo have brought to this comic, which truly make it look like nothing else. It’s one of the few places this comic feels truly unique. I’m not going to even front like I’m not totally in the bag for Grant Morrison, but doing a this kind of story so soon after his run wrapped feels like Snyder is desperate to go up a weight class and he just gets punched down here. Coming off a year when Snyder and Capullo had successfully retold Batman’s origin in “Zero Year,” it seemed like they were ready to bring a new take on the Joker here. Unfortunately, it’s just an assemblage of stuff we’ve seen before. Writing about Convergence every week has been surprisingly fun and informative. First of all, I never would’ve expected to be this into so many of the books. Second, while I’m not reviewing the main series this week, rest assured it’s gotten even more insane (it’s a Warlord story now, with everyone fighting each other in Skartaris). But the downside is that a lot of these books kind of run together, because the initial premise with the domes is comparatively restrictive. 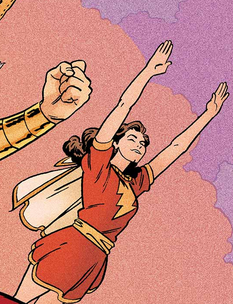 This sameness is what left me completely unprepared for Convergence: Shazam!, a master class in storytelling. For the first time, the premise of the domes became little more than a footnote. This issue could’ve easily been set in its own universe, as it’s much less about any larger events and more about what makes Billy Batson a hero, beyond superpowers or magic words. It’s clever, gorgeous, and high stakes without getting gruesome or uncharacteristically dark. Honestly, it’s a Parker/Shaner/Bellaire Captain Marvel story. That pedigree pretty much sells itself.